Over the last few years, juice has gained quite a bad reputation. The bulk of the blame for this goes to companies that have rolled out juice concoctions laden with chemicals and added sugar, causing an uptick in sugar intake, not to mention unnecessary calories. Don't worry though — in moderation, orange juice is healthy, as long as it's 100 percent juice and not from concentrate or a sugary juice "drink." When it comes to juice, orange juice is one of the healthiest options. Orange juice benefits include a healthy dose of vitamins and minerals with each portion you drink. The National Institutes of Health reports that 3/4 cup of orange juice has 93 milligrams of vitamin C, or about 155 percent of the recommended daily value. Other essential nutrients like potassium, a required nutrient for normal bodily cell function, also make up a big part of orange juice nutrition. One cup of orange juice has 496 mg of the stuff, or about 14 percent of the recommended daily value. If eating whole fruit all the time isn't your jam, never fear, according to the United States Department of Agriculture: An 8-ounce serving of 100 percent orange juice counts as a recommended serving of fruit in your diet. But because the sugar content of juice can be high, it's best to make the rest of your fruit consumption whole fruit. Keep your diet fresh with these slimming smoothie recipes. When extra nutrients are added to 100 percent juice, it's commonly called fortified juice. When extra calcium, for instance, is added, orange juice nutrients shoot through the roof. Calcium citrate malate is a mixed form of calcium added to juices for its health benefits. American Bone Health asserts that fortified orange juice has been known to help the body hold onto calcium with more ease, promote the building of bones in children and adolescents, as well as maintain bone mass in adults. Calcium-fortified orange juice is a healthy option for those who may be lactose intolerant or can't digest certain forms of dairy. While natural forms of calcium are definitely preferable, fortified products can also have a place in your diet. Be sure to experiment with a variety of juicing options if you have a B-12 deficiency. 100 Percent Juice or Whole Fruit? Eaten whole, oranges have many benefits that 100-percent orange juice doesn't offer. Even so, you shouldn't doubt orange juice nutrition and the advantages of drinking the juice of an orange, rather than eating it. Jeffrey Blumberg, director of the Antioxidant Research Laboratory at Tufts University, says, "Nutrients in some fruits and vegetables are more bioavailable when the produce is chopped, mashed, juiced." Give your immune system an extra boost with this ginger-turmeric shot. 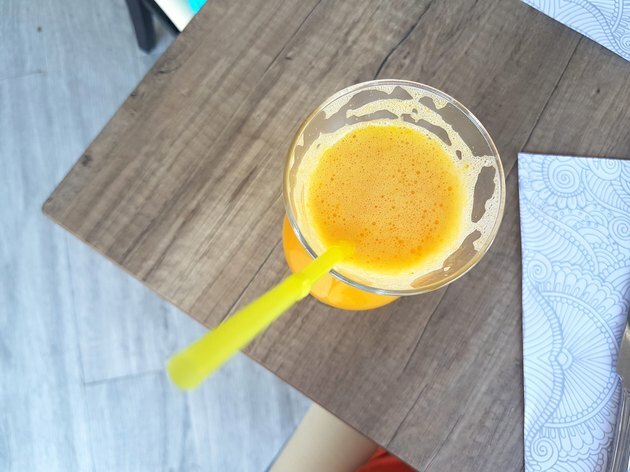 Regarding 100 percent orange juice, a study conducted by the Journal of Agriculture and Food Chemistry found that higher amounts of carotenoid, flavonoid and vitamin C were present during the digestive process than when pureed or whole fruits were consumed. This may be good news for juice-lovers, but it's best to rotate the amount of juice and whole fruit you eat for optimal nutrient benefits. American Bone Health: Is calcium in fortified juices a supplement?